The Xiaomi Mi3 has been leaked a few times before and the specifications of the upcoming flagship device have been in the rumorland for quite some time. Now, the smartphone has appeared on the GFX bench database and reveals the presence of a NVIDIA chipset inside, clocked at 1.8 GHz. The benchmark results also confirm that the smartphone will indeed sport a Full HD display with a 1920 x 1080 pixels resolution, as rumored before. 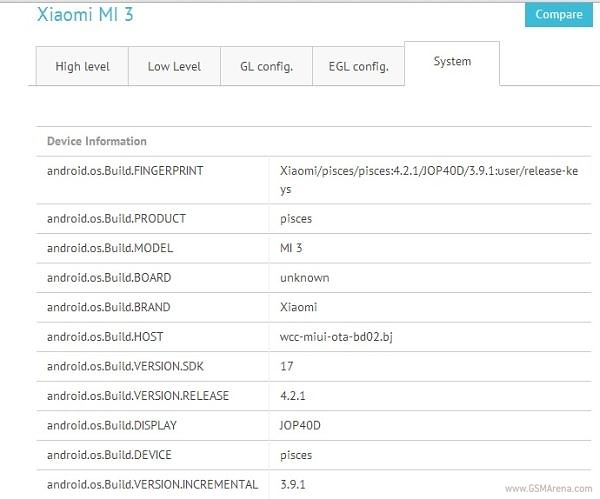 According to the GFX Bench database, the Xiaomi Mi3 will run on Android 4.2.1 Jelly Bean, but we expect the device to feature the later versions of Android during the time of its launch. The potential GPU scores of Xiaomi Mi3 are quite impressive, rubbing shoulders against the top notch smartphones on the market. Furthermore, the alleged specifications of the third-generation Xiaomi smartphone include a 13 megapixel rear camera, 2 GB of RAM and a 3,000mAh battery. They have two versions of Xiaomi mi3, one is with Tegra 4 at 1,8 Ghz and the other version with Snapdragon 800 at 2,3 Ghz Adreno 330.